We have found ourselves published again in ZOLA when we captured this beautiful couple in the Red Rock Canyon. It is no doubt the Red Rock Canyon's backdrop is breathtaking! There are so many lights in Las Vegas and Trent and Shelby wanted a natural setting with no frills for their intimate summer wedding. The weather and lighting could not have been better for a outdoor adventurous wedding. It is always a pleasure to photograph two people in love and for a photographer it was not a challenge with them. 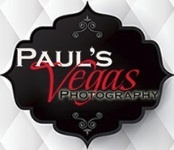 At Paul's Vegas Photography capturing special moments is what we do. We are also honored to be the official photographers for Adventure Weddings Las Vegas and offer all of our great photography services along with extras. Our award winning photography is one of the most reasonable in the Las Vegas area. Do not hesitate to give us a call to discuss your next adventure in Las Vegas. We are more than happy to plan it with you! 702-330-5838 or send a message.